Apple launched the ‘Swift’ language for application development for its products specifically in 2014. This made application development for apple’s products very specific. All the applications developed for iPhone, iPad, and Mac are in the swift language. Swift has various advantages over objective C and also has better performance with Apple hardware. Swift the Apple programming language is and will continually evolve over the years. It is great opportunity to learn the swift language giving us the great cutting edge over the other programs. There is a huge rise in the demand for talented iOS developers. Due to the growth in the need for developers students tend to go for iOS training in India. We are one of the top institutes to offer iOS training in India. We provide complete iOS training to those interested in learning iOS. Our iOS app development course includes step by step training, so our students don’t miss out on anything. We will learn Apple concepts using Swift. Our iOS application development course teaches students the details which Swift comes with, comparing with Objective-C, C++, and JAVA. As part of the course, students will learn the programming language Swift - a modern object-oriented language, optimized for writing applications for mobile devices. We cover all the aspects of swift language from scratch. Students Will learn the development basics discussed app for iOS platforms (devices iPhone, iPad, and iPod Touch), as well as a variety of frameworks, without which no cost, no modern iOS-application is developed. Though ‘Swift’ follows the same concepts as compared to other languages its basic concept remains the same. But still, it has some visible changes in it. Our faculties are very well versed with each and every aspect of the ‘Swift’ language, they have a huge experience in the same. The team of faculties that we have put together has a hands on experience in iOS application development and have worked on a wide range of applications. Our course includes modules which target specific chapters in every session of the IOS classes. Our iOS course syllabus also includes Projector based presentation for the better understanding of our students. 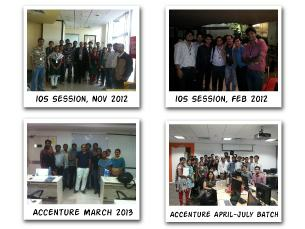 Students from across the cities have enrolled with us to learn iOS programming. One of the requirements for passing the course is the understanding of OOP principles, as well as experience in developing one of the languages of programming. Understanding this, we provide live projects or internships to our students after completion of this course. We offer iOS training in Mumbai at the most affordable rates. MacBook for each and every student so our students can learn better. Presentation & training on Projector during sessions. Certificate issuing after course completion. We have been the application development sector for the past 10 years. We have loyally served the IT industry with full faith and dedication. We assembled a dedicated team of full-time developers with and amazing hand and experience of the iOS application development. The team has delivered projects to clients across the globe. Our list of applications can be seen on our website. Our team has worked on a number of clients across the globe with applications like iAntiviruz, Geo-calendar etc. For making the iOS (iPhone,iPad, TV OS, iWatch & iMessage) apps, Apple provides two languages which are Objective C & Swift. Apple Swift language is latest one & has lot of benefits over Objective C. The Swift language is most readable language produced. How to optimised the application. Xcode IDE, Foundation and UIKit Framework, String ,UILable,UIImageView etc. Talk about the relationship between the window and root controller for the multi controller environment. Talk about how to create various classes in Xcode. When and where to use Storyboard. How is Size classes used. How Apple ecosystem is strongest of all. The importance of 5 golden points across the entire platform. Deploy the app/game that has been developed. Learn how to make .ipa file of the app.